The display on the multiple magnificent gold ornate stands, offsets the simple cake design perfectly. The structure of the Wedding Cake has evolved over time. Single tiered cakes, multi-tiered with columns, to deep tiers stacked sky high. I love this cake, simple and elegant with huge impact, letting the small details do the talking. It is the perfect example of how less can give you more! If the Royal Wedding Cake has inspired you to think about how to showcase your Wedding Cake, there are many options to consider. Where is your cake is displayed – in the middle of the room, under a staircase, in front of a mirror? On what will your cake be displayed – Table, Wooden barrel, Piano? 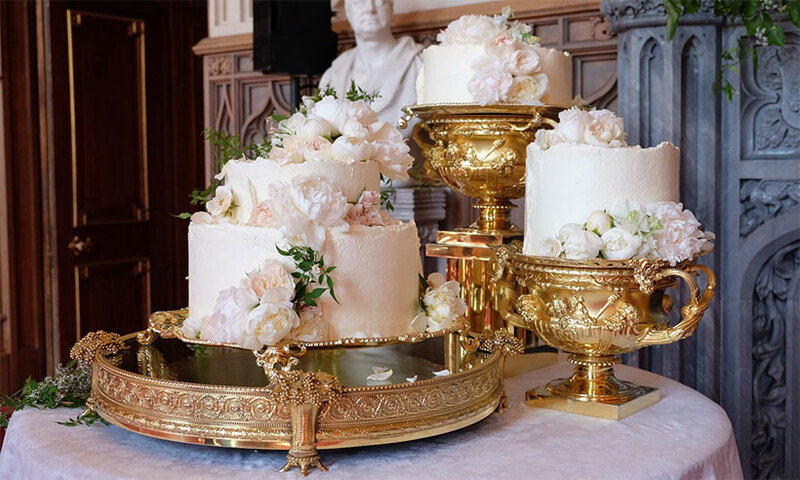 What kind of cake stand will you be using – Wooden log, a Glass Stand, Ornate Gold Goblets? Do you want to decorate around your cake or just let the cake do the talking? Do you want to use a tablecloth or table runner? Can you hang ribbons, flowers or fairy lights as a backdrop for your cake? The Wedding Cake has been a tradition since weddings first took place. One of your first acts as a married couple is to cut and share out your cake, passing on your good fortune and happiness in finding each other to your guests. So choosing your own Wedding Cake is an important part of your wedding planning and cutting your Wedding Cake is an important part of your wedding day. Make sure it’s a showstopper!